GraphX is the new (alpha) Spark API for graphs and graph-parallel computation. 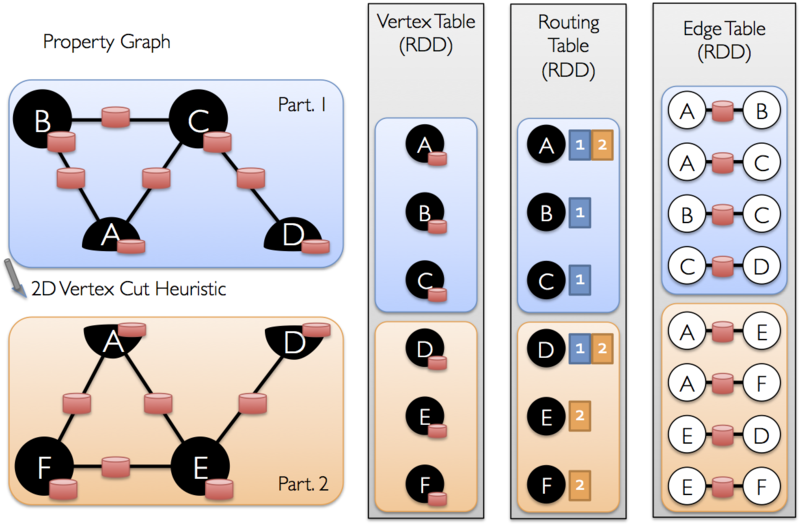 At a high-level, GraphX extends the Spark RDD by introducing the Resilient Distributed Property Graph: a directed multigraph with properties attached to each vertex and edge. To support graph computation, GraphX exposes a set of fundamental operators (e.g., subgraph, joinVertices, and mapReduceTriplets) as well as an optimized variant of the Pregel API. In addition, GraphX includes a growing collection of graph algorithms and builders to simplify graph analytics tasks. GraphX is currently an alpha component. While we will minimize API changes, some APIs may change in future releases. 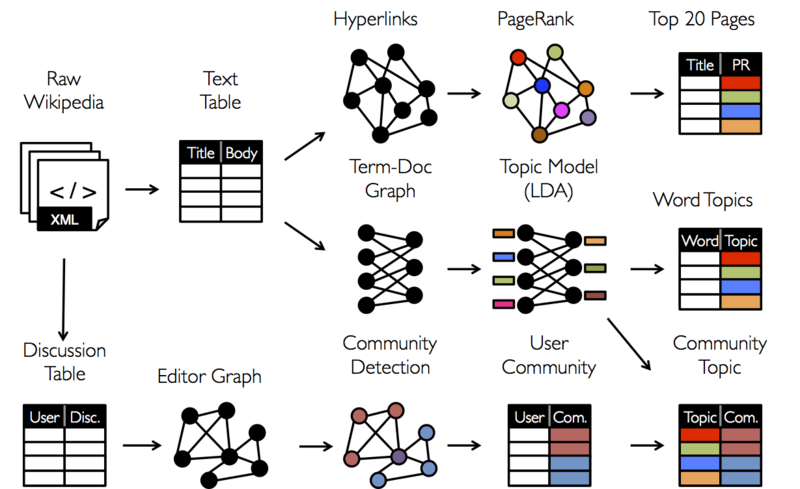 From social networks to language modeling, the growing scale and importance of graph data has driven the development of numerous new graph-parallel systems (e.g., Giraph and GraphLab). By restricting the types of computation that can be expressed and introducing new techniques to partition and distribute graphs, these systems can efficiently execute sophisticated graph algorithms orders of magnitude faster than more general data-parallel systems. 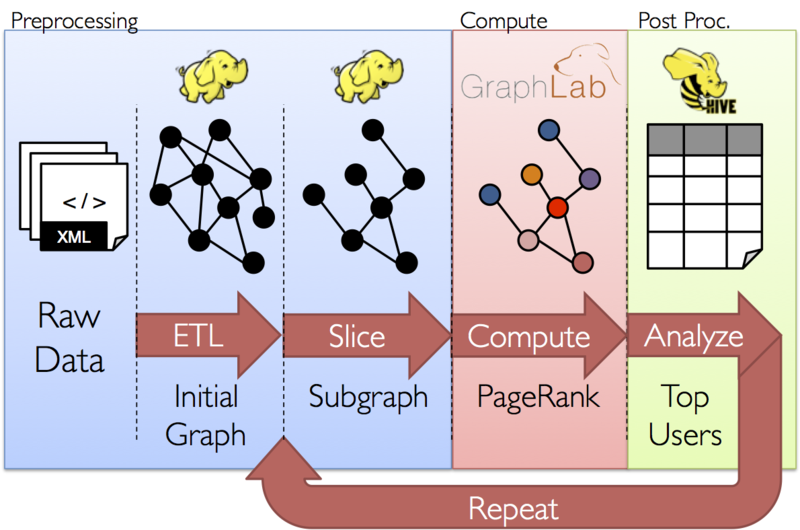 However, the same restrictions that enable these substantial performance gains also make it difficult to express many of the important stages in a typical graph-analytics pipeline: constructing the graph, modifying its structure, or expressing computation that spans multiple graphs. Furthermore, how we look at data depends on our objectives and the same raw data may have many different table and graph views. As a consequence, it is often necessary to be able to move between table and graph views of the same physical data and to leverage the properties of each view to easily and efficiently express computation. However, existing graph analytics pipelines must compose graph-parallel and data- parallel systems, leading to extensive data movement and duplication and a complicated programming model. The goal of the GraphX project is to unify graph-parallel and data-parallel computation in one system with a single composable API. The GraphX API enables users to view data both as a graph and as collections (i.e., RDDs) without data movement or duplication. By incorporating recent advances in graph-parallel systems, GraphX is able to optimize the execution of graph operations. 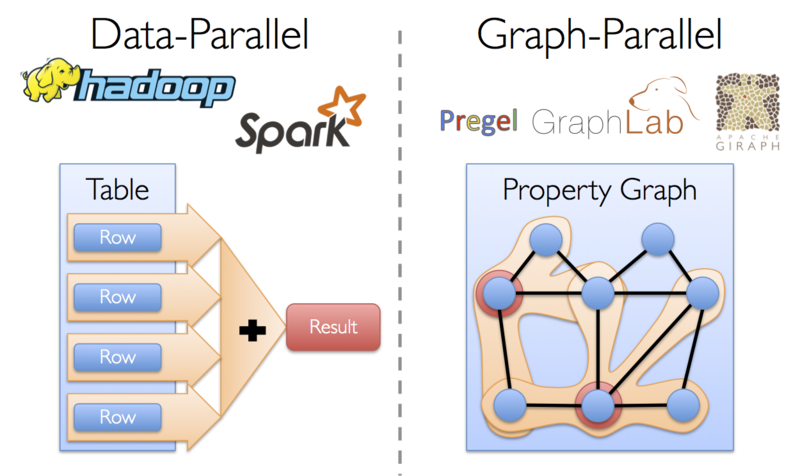 Prior to the release of GraphX, graph computation in Spark was expressed using Bagel, an implementation of Pregel. GraphX improves upon Bagel by exposing a richer property graph API, a more streamlined version of the Pregel abstraction, and system optimizations to improve performance and reduce memory overhead. While we plan to eventually deprecate Bagel, we will continue to support the Bagel API and Bagel programming guide. However, we encourage Bagel users to explore the new GraphX API and comment on issues that may complicate the transition from Bagel. GraphX in Spark 1.1.1 contains one user-facing interface change from Spark 0.9.1. EdgeRDD may now store adjacent vertex attributes to construct the triplets, so it has gained a type parameter. The edges of a graph of type Graph[VD, ED] are of type EdgeRDD[ED, VD] rather than EdgeRDD[ED]. GraphX optimizes the representation of vertex and edge types when they are plain old data-types (e.g., int, double, etc…) reducing the in memory footprint by storing them in specialized arrays. Like RDDs, property graphs are immutable, distributed, and fault-tolerant. Changes to the values or structure of the graph are accomplished by producing a new graph with the desired changes. Note that substantial parts of the original graph (i.e., unaffected structure, attributes, and indicies) are reused in the new graph reducing the cost of this inherently functional data-structure. The graph is partitioned across the executors using a range of vertex-partitioning heuristics. As with RDDs, each partition of the graph can be recreated on a different machine in the event of a failure. The classes VertexRDD[VD] and EdgeRDD[ED, VD] extend and are optimized versions of RDD[(VertexID, VD)] and RDD[Edge[ED]] respectively. Both VertexRDD[VD] and EdgeRDD[ED, VD] provide additional functionality built around graph computation and leverage internal optimizations. We discuss the VertexRDD and EdgeRDD API in greater detail in the section on vertex and edge RDDs but for now they can be thought of as simply RDDs of the form: RDD[(VertexID, VD)] and RDD[Edge[ED]]. The reverse operator returns a new graph with all the edge directions reversed. This can be useful when, for example, trying to compute the inverse PageRank. Because the reverse operation does not modify vertex or edge properties or change the number of edges, it can be implemented efficiently without data-movement or duplication. The mask operator also constructs a subgraph by returning a graph that contains the vertices and edges that are also found in the input graph. This can be used in conjunction with the subgraph operator to restrict a graph based on the properties in another related graph. For example, we might run connected components using the graph with missing vertices and then restrict the answer to the valid subgraph. Note that if the RDD contains more than one value for a given vertex only one will be used. It is therefore recommended that the input RDD be first made unique using the following which will also pre-index the resulting values to substantially accelerate the subsequent join. A key part of graph computation is aggregating information about the neighborhood of each vertex. For example we might want to know the number of followers each user has or the average age of the the followers of each user. Many iterative graph algorithms (e.g., PageRank, Shortest Path, and connected components) repeatedly aggregate properties of neighboring vertices (e.g., current PageRank Value, shortest path to the source, and smallest reachable vertex id). The mapReduceTriplets operator takes a user defined map function which is applied to each triplet and can yield messages destined to either (none or both) vertices in the triplet. To facilitate optimized pre-aggregation, we currently only support messages destined to the source or destination vertex of the triplet. The user defined reduce function combines the messages destined to each vertex. The mapReduceTriplets operator returns a VertexRDD[A] containing the aggregate message (of type A) destined to each vertex. Vertices that do not receive a message are not included in the returned VertexRDD. The EdgeDirection specifies which edges adjacent to the vertex set are included in the map phase. If the direction is In, then the user defined map function will only be run only on edges with the destination vertex in the active set. If the direction is Out, then the map function will only be run only on edges originating from vertices in the active set. If the direction is Either, then the map function will be run only on edges with either vertex in the active set. If the direction is Both, then the map function will be run only on edges with both vertices in the active set. The active set must be derived from the set of vertices in the graph. Restricting computation to triplets adjacent to a subset of the vertices is often necessary in incremental iterative computation and is a key part of the GraphX implementation of Pregel. In the following example we use the mapReduceTriplets operator to compute the average age of the more senior followers of each user. // Create a graph with "age" as the vertex property. Here we use a random graph for simplicity. Note that the mapReduceTriplets operation performs optimally when the messages (and the sums of messages) are constant sized (e.g., floats and addition instead of lists and concatenation). More precisely, the result of mapReduceTriplets should ideally be sub-linear in the degree of each vertex. Note that these operators can be quite costly as they duplicate information and require substantial communication. If possible try expressing the same computation using the mapReduceTriplets operator directly. Graphs are inherently recursive data-structures as properties of vertices depend on properties of their neighbors which in turn depend on properties of their neighbors. As a consequence many important graph algorithms iteratively recompute the properties of each vertex until a fixed-point condition is reached. A range of graph-parallel abstractions have been proposed to express these iterative algorithms. GraphX exposes a Pregel-like operator which is a fusion of the widely used Pregel and GraphLab abstractions. At a high-level the Pregel operator in GraphX is a bulk-synchronous parallel messaging abstraction constrained to the topology of the graph. The Pregel operator executes in a series of super-steps in which vertices receive the sum of their inbound messages from the previous super- step, compute a new value for the vertex property, and then send messages to neighboring vertices in the next super-step. Unlike Pregel and instead more like GraphLab messages are computed in parallel as a function of the edge triplet and the message computation has access to both the source and destination vertex attributes. Vertices that do not receive a message are skipped within a super- step. The Pregel operators terminates iteration and returns the final graph when there are no messages remaining. 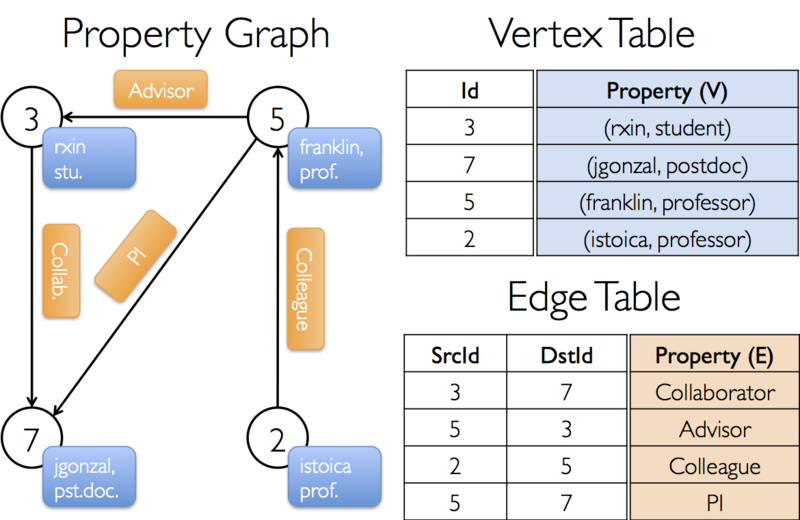 GraphX exposes RDD views of the vertices and edges stored within the graph. However, because GraphX maintains the vertices and edges in optimized data-structures and these data-structures provide additional functionality, the vertices and edges are returned as VertexRDD and EdgeRDD respectively. In this section we review some of the additional useful functionality in these types. Notice, for example, how the filter operator returns an VertexRDD. Filter is actually implemented using a BitSet thereby reusing the index and preserving the ability to do fast joins with other VertexRDDs. Likewise, the mapValues operators do not allow the map function to change the VertexID thereby enabling the same HashMap data-structures to be reused. Both the leftJoin and innerJoin are able to identify when joining two VertexRDDs derived from the same HashMap and implement the join by linear scan rather than costly point lookups. The EdgeRDD[ED, VD], which extends RDD[Edge[ED]] organizes the edges in blocks partitioned using one of the various partitioning strategies defined in PartitionStrategy. Within each partition, edge attributes and adjacency structure, are stored separately enabling maximum reuse when changing attribute values. In most applications we have found that operations on the EdgeRDD are accomplished through the graph operators or rely on operations defined in the base RDD class. Once the edges have be partitioned the key challenge to efficient graph-parallel computation is efficiently joining vertex attributes with the edges. Because real-world graphs typically have more edges than vertices, we move vertex attributes to the edges. Because not all partitions will contain edges adjacent to all vertices we internally maintain a routing table which identifies where to broadcast vertices when implementing the join required for operations like triplets and mapReduceTriplets.